The week after Jane Jacobs died, the NY Times architectural critic, Nicolai Ouroussoff, wrote this smug, condescending assessment of "the great lover of cities" (a description that diminishes her) and we haven't been able to read a subsequent word of his without thinking: dolt. A year before her death, the urban activist Jane Jacobs, then 88, wrote a remarkably prescient letter urging Mayor Bloomberg to scuttle his plans for the Williamsburg waterfront. 'Even the presumed beneficiaries of this misuse of governmental powers, the developers and financiers of luxury towers, may not benefit,' she wrote. 'Misused environments are not good long-term economic bets.' Four years later, Jacobs' prophecy has been realized. The Times critic complains that Ms. Jacobs had "few answers for suburban sprawl or the nation's dependence on cars," effectively blames her for the failures of Battery Park City, and chides her for failing to appreciate the "heroic scale" of Los Angeles freeways. Seriously: dolt. 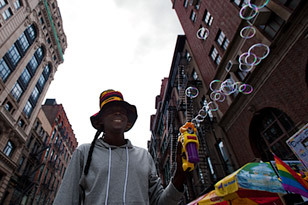 You want to take on Jane Jacobs? Fine, man up and do it to her face, while she has the ability to respond. Otherwise, take an extended hike along those heroic freeways. 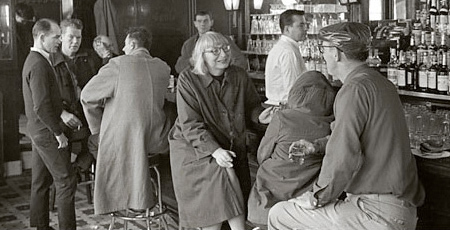 The pleasing news for Jacobs fans is that Hudson Street between Perry and West 11th (Jacobs lived for many years at 555 Hudson) will be renamed Jane Jacobs Way, an idea first proposed by the Greenwich Village Society for Historic Preservation following her death in 2006. And coming next week, a new book by Anthony Flint about Jacobs called Wrestling with Moses: How Jane Jacobs Took On New York's Master Builder and Transformed the American City.